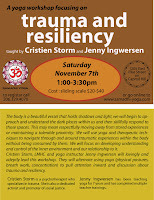 "We will use yoga and therapeutic techniques to navigate through and around traumatic experiences within the body without being consumed by them. We will focus on developing understanding and control of the inner environment and our relationship to it." On October 13 I attended an event that was organized by Therapeutic Justice Project member Cristien Storm and her colleague Kate Boyd, who together form the organization "If You Don’t They Will". This group trains individuals and organizations how to effectively identify and counter white nationalism and supports communities in reducing and responding to hate. The event, which was co-sponsored by TJP, was a screening of the film “The Dhamma Brothers: East meets west in the deep south” followed by a panel discussion. The film is a documentary first released in 2007 about the introduction of vipassana meditation practice into the rehabilitation program at a high security prison in Southern Alabama. The film begins by introducing us to several men incarcerated in the prison, and giving us a little bit of background on each of them including descriptions of their crimes (all were incarcerated for murder). It then follows what happens as two outside meditation teachers come into the prison and do a 12-day silent retreat with the group of inmates who choose to participate. There are interviews with each of the men, some of their family members, as well as the warden, psychologist and other prison officials. Without a critical analysis this film could be viewed in a very positive light. This would be especially true for those living from a dominant social awareness. The prison psychologist talks about two approaches to incarceration: lock individuals away and forget about them, or provide treatment and rehabilitation. Not only was this facility providing some treatment, but it was stepping pretty far outside of the box of traditional rehabilitation, by introducing an approach that is novel and progressive, especially in bible belt southern Alabama. Further, the film depicts the inmates as experiencing many benefits of the retreat and their continued meditation practice, including facing their crimes in a more honest way than they had before, and getting in touch with feelings of grief about losses they had experienced. The tone of the film suggested optimism that prison can be a healing place, and that meditation can be a valuable tool even in this unlikely setting. However, there is a lot missing from this picture. In their invitation to the event Kate and Cristien highlighted the fact that so often trauma work is conceptualized on a very individual basis. Further, there is little analysis of the societal conditions that can lead to criminal behavior and incarceration and the ways that institutions such as prisons perpetuate abuse and violence. This analysis was starkly missing as we viewed the film: there was only passing reference to circumstances such as racism, lack of access to resources, family and community violence, and trauma that were likely antecedents to the mens’ behavior. Both their behavior and the treatment approach were conceptualized as intrapsychic: the problem, and the solution, lay within. Similarly, problems in the prison (gambling, substance use, prostitution, and violence) were passingly mentioned, but again seemed to be attributed to the mens' moral fiber rather than complex causality and existing in the context of systemic issues. Further, there was absolutely no mention of the prison system itself, and the financial and social agendas that might keep that system in place. Also disturbing was the portrayal of meditation as almost an anesthetic, making the men more compliant and easier to get along with. There was a suggestion that meditation only got people in touch with the “softer” emotions such as sadness and self-compassion, and there was a lack of exploration of anger, at the injustice of their incarceration and/or the circumstances leading up to it. After the film, a panel answered questions posed by both the event organizers and the audience. The panel consisted of four community activists with expertise in bringing a critical sociocultural analysis to healing work. It included: Sooja Kelsey, founder of the Race/Knowledge Project; Nathan Shara, social justice therapist and community educator (and TJP member); Shamira Shirdel, who works in anti-domestic violence advocacy for immigrant women; Elaine Waller-Rose, who does interreligious and intercultural work around overcoming racism. Much of the discussion centered on the prison industrial complex, including the need for a radical rethinking of how society deals with those who commit egregious crimes. The community accountability model was mentioned as one such alternative. We also discussed the need to link individual trauma work with radical social movement, in this case the prison abolition movement. Criticisms of the prison system include the fact that it has become a privatized, profit-driven industry more interested in making money and suppressing social problems such as racism, classism and poverty than in rehabilitation. I had thought that the discussion would be focused primarily on the prison system and the lack of analysis in the film, but it actually ranged far beyond that. I very much appreciated the discussion of integrating individual healing with social movement work, and the idea of “self-care” as so much more than “going home and taking a bath with scented candles” so you can return to the movement. People shared ideas about how not to get frantic, stressed and overwhelmed in social movement work, including the importance of long-term visioning (Generation 5 being one great example of a group that is looking at what changes need to happen over 5 generations to end childhood sexual abuse), paying attention to our bodies and our emotional and physical needs, and bringing playfulness and joy into our work together. We also talked about how trust building and the interpersonal work that goes on in groups is just as important as the work that gets done in the world. This last part was especially helpful to me, as I had very publically expressed some grief and frustration at our last retreat that we are spending so much time building our foundation, and not yet able to put our feet on the ground and do some work together. It is slowly sinking in that the work we are doing together —by building a trusting, cohesive group, one in which challenging discussions can take place around privilege and tokenizing and representation and leadership—is not separate from the work that we will do together out in the world, and this event’s discussion helped to solidify that. The organizers of this event are "If You Don’t They Will," and I found myself musing about their name, what it might mean and how it relates to this film. If you don’t what, they will what? Some thoughts I had are that if people and systems who are marginalized don’t name and define yourselves, your self-worth, and your lived experience, they (society, authority figures, parents, schools, the justice system) will. And if you don’t focus on your own empowerment and work to change things for the better, they will work to maintain the status quo. And if you don’t work toward addressing systemic inequities, they will work toward maintaining privilege and control. Cristien and Kate, I don’t know if that’s what your name means (and I will ask you in person the next time I see you) but I want to thank you for bringing us together to share such a stimulating and supportive evening. - Our group has a new name! We are now Therapeutic Justice Project. We feel this name captures well what we are trying to do, including infusing healing work with a social justice and anti-oppression focus, and bringing therapeutic healing to social change work. The name was unanimously approved by the group present at the retreat. If you weren't in attendance and have any objections to it please write to one of us, and in the future we will be sure to present major decisions to the entire group in advance of retreats, so you can give us feedback and your thoughts and feelings can be represented at the meeting if you are unable to attend. - Note that you can now download a general TJP flyer, as well as a consult group flyer, directly from the blog (right-hand column under the vision/mission statement). We hope you will find the blog to be a place for connection, resources and information. - A socioculturally focused psychotherapy consult group will begin in December, every 1st Thursday of the month, led by Anne Phillips, at her office, sliding scale $25-$50. For more information contact Anne at 206.297.5929. - Starting in 2010, TJP will have annual dues of $5-$500 pay what you can. Dues for 2009 are also welcome. - Decisions will continue to be consensus based and will typically involve the leadership council presenting a decision to the larger group for discussion. Your vote will count if you attend retreat (or register your thoughts with us beforehand, if unable to attend) and are a dues paying member. Your thoughts and feedback prior to a meeting will always be welcome and considered, regardless of attendance and dues status. - We will be starting a new Leadership Council to steer the group and everyone interested in being part of the council is welcome to join us in the first meeting to determine the size, membership, and scope of this group. Our next step is to set the first leadership council meeting. Please let us know if you would like to attend and, if so, what are generally good times for you during the week. We look forward to seeing you and/or hearing from you over the next couple of months. Please let us know if you would like to participate in the consult group, join the leadership council, or have any other questions. I attended a dinner where I heard about some on-the ground organizing taking place in the Northwest and the Rockies. To me it seems there appears to be some lack of communication about what work is happening and where it overlaps. That this may speak to the disengaged culture of this region. The Social Justice Fund, which used to be called A Territory Resource, recently joined forces with the Western States center to fund grassroots projects which have already proven they posses the momentum to change and implement policy. The schools were built, the predatory lenders were made to be accountable, etc. The funding of these groups is intended to build on the momentum generated by the election. We got to see a movie about the 9 regional organizations’ work. It was very cool to even know what is being done to eradicate poverty in Washington, specifically. And it was also very cool to learn about what is happening in Oregon, since that feels like my home more than any other place, even though I live in Seattle. And then they served us some cheesecake and Sister Helen Prejean came up to the podium. I got the sense that people loved her immediately. Sister Helen is the main character from the movie Dead Man Walking where Susan Sarandon became close to a death row inmate during the months before his execution. She continues to do this work and has more recently written a book called Death of Innocents. She talked about her experience of becoming politicized, about moving from the distant place of being a nun, separate, praying for people-to being with people and connecting with their suffering. That experience woke her up. She saw her friend’s child killed by a neighbor and said, “My mom never had to worry when I went out to play or my sister or brother whether I would be killed”. And how when Black people get killed there is no mention of it in the New Orleans Picayune, but when white people are killed it makes the front page. She talked about the victim’s family getting ensnared in the politics of what was being called justice. Killing the perpetrator, the prosecuting attorneys said, was somehow to get justice for the lives lost. But how does that bring anybody back? she pointed out. I mean we all already know the death penalty is awful and off base, but she told it so well, it sunk in even deeper. She has a great way of moving so easily back and forth between story and message. And then she talked about the experience of being the one person in the death house who looked at him with love as he was being executed. She was, to him, the face of Christ as the guy died. They do it in private, she told us, a private ritual of justice killing. And then she brings it home by –get this - making the link how our compliance with the death penalty just tills the soil for the cruel and inhumane torture of inmates at Guantanamo. We all just took it in the gut. She really nailed it beautifully. There is so much more, but that’s the gist. She said that it might seem too overwhelming to imagine having to fix the whole machine, and hearing that definitely helped me. I for sure spin out into the idea that it’s all too big. Grab the rope where you are and start to pull, she told us. But I am not sure. Are we pulling our end of the ropes just by being therapists who utilize a sense of social justice? If we are politicized, but not lack a developed analysis, do we run the risk of doing more harm than good? How do we know whether we know enough to act? Do our gaps in knowledge give us permission to not take risks? In couples therapy there is a cliche that gets thrown around that "love is a verb, not a noun". Trite though it is the phrase does capture an important principle of relationship satisfaction, that to love someone requires repeated actions (internal and external) that are loving and that love is a process, not a commodity. Similarly, I am learning (and relearning and relearning) that to be an ally is a verb, a process, not a static quality or status that I possess. This learning can be painful and humbling but is so worth it. Racism takes many forms. To perpetuate racism, I don't have to make derogatory comments, exclude someone, or believe in a common stereotype. I can abhor personal expressions of overt racism, but still overlook covert racism, especially my own, especially if I'm not vigilantly working to spot and root it out of my system.... If I don't want to perpetuate racism, I have to consciously and diligently reshape my assumptions and instincts, because even though I reject the idea of white superiority, it is how I was socialized and it still fills the air I breath (Margie Carter). Like this author, sometimes I am easily able to name those more public expressions of overt oppression, but overlook some of my own blind spots. There are many examples of this. For one, my education and training as an academic psychologist causes me at times to present my thoughts in a way that can be distancing, naming the experiences of people with target membership in a way that sounds like a research study. The biased world view of researcher and study subject is one that I am still trying to unlearn. For another, I sometimes make assumptions about the internal experiences of people different from myself, rather than simply asking and listening. Third, I am quick to spot examples of personal oppression (both internalized and external) but am not as attuned to systemic oppression. Fourth, my efforts to be inclusive can be unintentionally tokenizing, especially if they are not backed up by really moving the center of power to the individuals I am trying to include. Finally, seeing the patterns is not enough; I need to take steps to change (or at the very least not participate in) the systems that support continued oppression. As an agent, naming the inequities would mean changing a system which gives me automatic privilege, and acknowledging that I am a part of that unjust system, and both of these are difficult. It is something, but not enough, to notice the patterns. My privilege allows me to not see those things, to look away, to walk away. Once seen, my privilege allows me to ignore, or not to acknowledge. Once acknowledged, my privilege is to not do anything to change the structures that hold these inequities in place, because by changing those systems I put at risk the privilege those systems bequeath to me. People who do not hold dominant social memberships do not hold those privileges, and if I am to truly be an ally I need to be vigilant to the ways my privilege blinds me, makes me inactive, and makes me withdraw from the hard work. Sometimes this work reminds me of running. When I go for a run, I am usually a happy camper as long as the terrain is level, and the weather temperate. As soon as I hit an incline (or it's too rainy, or too cold, or too hot, or my legs hurt) I want to slow down. Or walk. Or not head out in the first place. In my work as an ally, as soon as a blind spot is pointed out to me, or a blunder made (no matter how unintentionally) there is that reflexive part of me that says "this is too hard," or that retreats into a place of defensiveness or shame. Yet truly what I want is to be open, to learn, to be able to make mistakes in my relationships with friends and colleagues with different social memberships than mine, to be an effective ally. So I keep trying. So, what I pledge to do as an ally is this: acknowledge the inequities I see (don't look away), say them out loud (don't be afraid to have a voice), engage in discussion around difference (don't be afraid to make mistakes), and work actively toward shifting the center in the groups and organizations I am a part of (be willing to give up privilege). In our group, I hope we can continue to create an atmosphere where we can have respectful dialogue with one another about difference, to reflect the world that we want to see in the microcosm of our group. Racism, classism, transphobia, homophobia, ableism, and other forms of personal and systemic oppression are factors in our group. Especially in the areas where we have social privilege, we will not see everything, but we can support each other in seeing and naming as much as we can, and trying to understand more. We can only feel safe in a world/group/family/relationship where we don't feel we will be censured by naming difficult truths and where we trust that those truths will be held with respect. In this last Sunday's New York Times Magazine, Robin Marantz Henig explores the possible genetic, biological predisposition to anxiety. The article refers to studies done by developmentalists like Jerome Kagan who have used homogenous samples of, for example, White, middle-class babies and traced their experience of anxiety in longitudinal study, across the years. What this author seems to conclude is that our brains may, in fact, get hard-wired to worry. "Born with a lower threshold for arousal", there are just certain people who tend to "stay on guard, anxious, and wired, even when the situation is not threatening (Henig, 2009)." In these cases, she explains, there is a hyperactive amygdala, the place in the brain that responds to novelty or threat (Henig). I was moved to post this after reading it and feeling that gut-level sense that there is a lot missing in this piece. For example, although parenting is mentioned as a potential factor in the anxious behaviors of babies, young people and adults, it is considered difficult to study and inconclusive. Similarly, the article is approaching the issue from just one position, the scientific view, rather than a systems perspective or personality typology, for example. Also, what does it mean to think that using a sample of White, middle class people will somehow result in a conclusion about human behavior overall? Obviously the intention is to eliminate environmental differences, but what does that ultimately do to the relevance of the research? These are some questions I have. But, check it out and tell me what you think, too.